The other day I shared a fun Easter tradition similar to the Elf on the Shelf, that you hide and seek a plush bunny right until Easter. Today, I wanted to share another wonderful Easter tradition fans of the elf would love, as they count down until the Easter Bunny's arrival on Sunday, April 1st. Introducing Chick in a Basket...that is Agent Chick to your family, and he comes dressed as a secret agent ready to teach your child about responsibility and kindness through a fun Easter Bunny on the Shelf adventure. Agent Chick arrives in a top secret box, along with a book that shares the story about Chick in a Basket and a special golden egg which holds good deeds your child is to do as they count down to Easter. Sounds like fun, right? We have had Chick in a Basket for about a week now and the girls are loving it. The first night we got this lovely set in the mail, the girls chose the perfect basket to sit their Agent Chick in. They put the golden egg in the basket with him, and went to bed, looking forward to the golden egg hunt the next morning. Like I shared in my previous post, we do Elf on the Shelf, but I had to scale back as I was getting stressed trying to find crazy antics and setups for the girls' elves each day. So, instead of crazy antics, we have the elves move about each night into a new spot for the girls to find. It is so much easier, and just as fun as the girls really like the hide and seek each morning. Knowing this, I knew that they would get a kick out of the Chick in a Basket adventure, and that they did! This fun new Easter tradition starts a dozen days before Easter -- but, you could still order now and double up on the good deeds, as you count down to Easter morning. 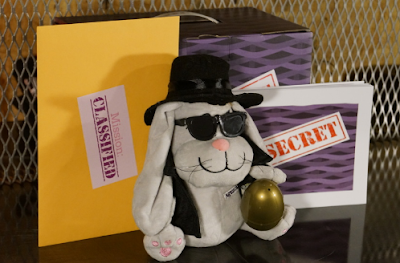 Your kids will be excited when they meet Agent Chick, a secret agent bunny that will be sent each year by the Easter Bunny. When your children sleep at night, Agent Chick will sneak out of his basket and hide the magic golden egg for your child to find. Inside the egg will be a good deed that your child has to do each day. 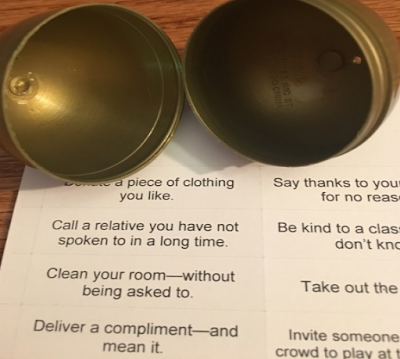 This set comes with good deeds already printed out on paper slips, as well as blank slips you can add your own personalized good deeds to. My girls woke the first day after Agent Chick arrived, and found "Make Your Bed" and "Help someone out without being asked" as their good deeds. As a parent who struggles to get their kids to pick up their toys, put their dirty clothes in the laundry room and make their beds, I wasn't sure if they would make their bed. But, they were all excited about Agent Chick at our house and knowing that he would be reporting back to the Easter Bunny, they were quick to run upstairs and make their beds. And, when we were at the market later in the day, Bella picked up item that fell from the shelf for the person in front of us. Savannah gave an older lady a cart when she entered the market as I was getting one for myself. I loved seeing my girls doing this good deeds, and they loved doing something nice for others and seeing how these small things mean a lot to others. My girls could see that I didn't have to stop what I was doing to make their beds or remind them to make them, and I loved seeing them help others at the market and smile when they were told "Thank you." There is a blank month sheet that comes with this set that you can hang up and mark off each day your child successfully does a good deed. This lets them keep track of how many good deeds they have done, and also count down to Easter. My girls are excited for the Easter Bunny to arrive, but are also a little sad as they don't want to see Agent Chick leave. They have gotten used to seeing him every morning, and love looking for the magic golden egg and seeing what good deed Agent Chick wants them to do for the day. If you are looking for a fun new Easter tradition to add to your family's Easter celebrations and countdown, then why not consider picking up Chick in a Basket. My girls love it, and I know your kids will, too. To learn more about Chick in a Basket, including ordering a set includes book, Agent Chick, golden egg and pre-printed good deeds, head on over to https://www.chickinabasket.com/. This sounds like such a great idea and one the kids would really enjoy thank you for sharing this one.